The word periodontal literally means "around the tooth." Periodontal disease is a chronic bacterial infection that affects the gums around the teeth and the bone supporting the teeth. Periodontal (gum) diseases are serious infections that, if left untreated will deteriorate the bone and ligaments that support the teeth, eventually leading to tooth loss. 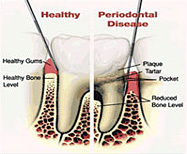 Remember, there is NO CURE for periodontal disease; however it can be managed and/or controlled. The condition will only worsen without proper treatment and home care. Fortunately there are many treatment options available, including both surgical and non-surgical procedures.